Avatar takes place on the planet Pandora. Pandora is inhabited by the Na’vi, a blue humanoid species, with feline characteristics. The Na’vi are also much taller and stronger than humans. Pandora is filled with wondrous flora and fauna, unlike anything seen on Earth. It also has large deposits of a rare mineral called Unobtainium. The RDA corporation, run by humans, has landed on Pandora and is trying to harvest this rare and expensive mineral for profit. One of the largest deposits of Unobtainium is right beneath a large Na’vi tribe. The only option for RDA is to move the Na’vi to a different location, any way they can. 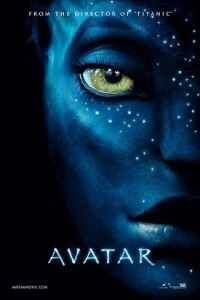 A scientist, Dr. Grace Augustine (Sigourney Weaver) developed a way to combine Human DNA with Na’vi DNA. These Na’vi are called Avatars. Each Avatar has a single “host” who controls it — basically whoever’s DNA they used to create it. The humans mind is then connected to the Avatar’s mind which allows the human to go out in Pandora to interact with it’s surroundings as a Na’vi might. The main character, Jake Sully (Sam Worthington), is put into the Avatar program by happenstance. He is an ex-Marine, paraplegic and is used by RDA Corporation to negotiate the Na’vi’s eviction. With the promise of getting his “legs back” he becomes torn between his growing love for the Avatars and his orders. I really thought the 3D added to this movie, the planet Pandora was remarkably beautiful and the 3D added to its believability. James Cameron (the creator of Avatar) worked long and hard to create what he created and succeed greatly in imagining this beautiful world. This was my first 3D movie, in a long time. The last one I remember was an IMAX movie at the Bostom Museum of Science with Red and Blue glasses. Cameron actually had a special camera developed to create a new “3D” for this movie. I still felt like this 3D gave me a bit of a headache. In my opinion, the problem with fake 3D is that your brain feels like it should be able to focus on certain objects, but the director wants you to focus on different objects. In real life, if a sword point is right in your face, you can focus on the tip of the sword or the person holding it. In a 3D movie, if you try to focus on the tip of the sword, but the camera man is only focused on the person holding it, your brain freaks out and gives you headache. At least, that’s how I think it works :). So, yes, I did leave Avatar with a slight headache, but it was worth it just to see the 3D version of this movie. In order to truly critique Avatar you have to compare it to Star Wars. Why? Because James Cameron’s goal with Avatar was to beat the socks off of George Lucas . Cameron has actually been working on Avatar since 1995… probably before that in his mind, since he was inspired to become a director after watching Star Wars. However, the technology was not where it needed to be in 1995, so he had to sit on it… and he sat on it for a long time. But he wasn’t just sitting, he was working on helping improve 3D by convincing Sony to develop a special 3D camera. Then he had to work on getting buy-in for 3D projects from movie theatres, which required him to support other movies going 3D before he could do Avatar. He worked with a linguist to create the a language for the Na’vi to speak, they named all the flora and fauna on Pandora, with Na’vi words, English words, and Latin words. I really get the impression he has spent his whole career on trying to beat Lucas – even if it was only the past 15 years. So, what did I think of the movie? Well, Cameron succeed in making a much better version of The FernGully. The plots between Avatar and FernGully are almost identical.If you do not remember the movie, it was animated, and put out by FOX back in 1992. I actually remember it fondly and thought it was a good movie when I was 12. The protagonists in FernGully were harvesting trees from the rain forest, not Unobtainium from Pandora. The victims were magical fairies, not the Na’vi. The “hero” was a logger who was accidentally “shrank” to fairy size by one of the fairies to save him from being crushed by a falling tree, not an ex-marine turned into an Avatar. Other than that, the plots are very similar. Of course The FernGully was a lot more silly because it was a childrens movie and Avatar is much more mature. I do find the similarities/differences to be quite humorous though. Do I think that Avatar is going to be the next Star Wars? Well, it’s hard to say. Star Wars was a like nothing ever seen before in the theatres. It was also big enough to have a franchise created from it. Avatar is like nothing ever seen before in theatres, but I’m not sure its big enough to have a franchise created from it. Star Wars took place in the Universe, not just a single planet with a single victim. In Star Wars thousands of components and characters worked together and against each other. In Avatar, it was just one group of victims, one group of protagonists, and one group of heroes. All of the success Star Wars had, plus a driving vision from George Lucas allowed Star Wars to become a huge franchise. I have no idea what Cameron’s vision is for the next “Avatar” (if there will be one)… but if he wants to beat Lucas, he needs to have one. Right now, all Avatar has is beautiful CG and a borrowed plot. That’s not to say that Avatar was bad, it was good, it was really good. I felt very connected with the characters, the movie made me wish I was on Pandora and that I had the ability to be an Avatar, to experience what Jack Sully was experiencing. I would recommend seeing this movie, especially in 3D. I have to give this movie 4.5 Circus Peanuts. Cameron succeeded in pouring his life work into this movie and coming out with something great… I hope he can continue the franchise like Star Wars, but I doubt it will happen. But they did make a sequel to FernGully, so I could be wrong.